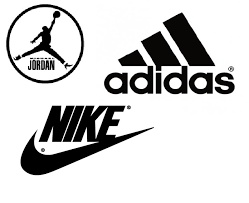 Are Adidas, Nikes, or Jordan’s better to play basketball in? Basketball and fashion are my first two loves. It’s ironic that the greatest to ever play the game also creates my favorite sneakers. The greatest to ever play the game is Michael Jordan. He holds the NBA for highest career regular season scoring average and highest career playoff scoring average. He has won 6 championships with one team, and holds five most valuable player awards. As a child I idolized Michael Jordan as a basketball player. Now that I’m older I still idolize him as a player but even more as a businessman. Jordan’s seem like they would be the basketball shoes because they come from the best player. Where I’m from everyone either wanted to be like Jordan or have every sneaker he came out with. But players in the NBA play in sneakers from Reebok to Nikes. Most people aren’t aware that Jordan’s are another form of Nikes under their brand subsidiary. So do the shoes make the player or the player make the shoes? I tried to gain as much research as possible, but with my findings there were no studies done to develop a general answer as to which shoe creates the best performance. When NBA players look for sneakers to play in, they look for shoes that are both secure and durable. NBA players need solid traction and superior lock down in order to maneuver freely without any hesitation. According to ESPN the top ten players of the NBA 2015-2016 season right now are Stephen Curry, James Harden, Paul George, Kevin Durant, Lebron James, Russell Westbrook, Damian Lillard, Blake Griffin, Anthony Davis, and Kyle Lowry. (In that order) Each of these players has their own unique style of play but also all wear different sneakers. Stephen Curry the number one player in the NBA averages 34.4 minutes and 32.2 points per game. He’s the best player in the league right now and he wears sneakers by Under Armour. As you can see by the chart, players who wear Under Armour average the least points. Having the most points doesn’t make you the best player because there are other things to take into encounter such as defense, rebounding, games won with the team etc. But Stephen Curry and the Golden State Warriors are the reigning champions, he won the MVP award last year, he’s number one in the league at the moment, and the Warriors are leading the NBA with the best record 27-0. In addition to players wearing Under Armour having the lowest points, they also average the lowest rebounds and steals. Then comes Adidas and then comes Nike. The most common shoes worn in the NBA are Nikes. NBA players who wear Nike seem to have the most points, rebounds, and steals. 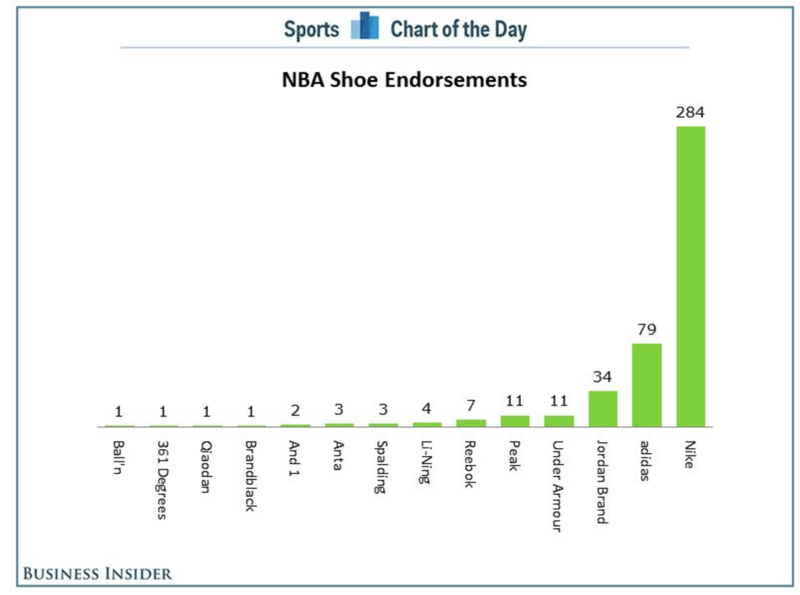 Of the 442 NBA players 284 wear Nike, and Nike endorses 79 players. So how can Stephen Curry be the best and he doesn’t wear Nikes? Could he just be lucky? Or does the man really make the shoe? Therefore, this idea perfectly demonstrates the concept of correlation doesn’t equal causation. Just because Micheal Jordan is the greatest many people buy his sneakers trying to imitate him. Thinking that wearing Jordan’s would give them his skill or make them a better player. Many people in the NBA wear Nikes but the best player in the league at the current moment wears Under Armour. As stated previously Under Armour has the lowest ratings for players. This shows that basketball is mainly about skill. If I really wanted to find out which shoe generates the best performance, I would conduct an experiment taking random players of gender, age, etc. and giving them random shoes and assess information that way. But even with that you can’t come to a complete conclusion. You can’t rely on a shoe to tell you which generates the best performance because there are other things you have to take into affect when finding out what generates the best performance. There are third confounding variables such as age or height that also play a role in generating a player’s performance level. There is no specific way to tell if Nikes, Adidas, or Jordan’s are better to play basketball in. This entry was posted in Uncategorized on December 11, 2015 by aes5559.